If your are not satisfied with the default iOS calculator and want an advance calculator that will give you more scientific calculation functionality then Calculator³ (Cube) app is a great choice for you. Calculator³ is the 3 in 1 multi-function scientific calculator for iPhone, iPod, iPad been useful for everybody from basic calculation users to more advanced such as students, scientific computation engineers, programmers. 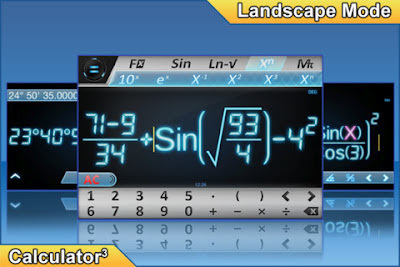 Calculator³ scientific calculator app is equipped with a natural display right at the center offering a greatly new user's experience. Input data was dealt much more easily with a 2-part keyboard. Besides, the Equality Universal key promises more features in further versions. It gives you support of Fraction (Mixed fraction) Calculation, Time/Hexaximal Calculation, Variable & Memories. TO improve the calculation usability Calculator³ scientific calculator includes a calculation History, Copy/Paste, Undo/Redo functions. Download free Calculator³ for your iPhone, iPod, iPad (free for limited time only). Calculator³ File Size 12.5MB. Calculator³ Website.